Sometimes, you need to use shortcuts to get dinner on the table....this is one of those recipes. I start off with a store bought package of frozen cheese stuffed pasta shells and a jar of meatless marinara, then add ingredients to make it taste like it's homemade. The point value I am providing is accurate if your frozen cheese stuffed pasta shells come to 4 pts for two shells, your marinara is 1 pt per 1/2 cup serving, and your turkey sausage is 3 points for 4 oz....otherwise, you will need to adjust the points as necessary according to your key ingredients. Tonight, I served these with an arugula and roasted red pepper salad, dressed in a simple olive oil and balsamic dressing. Yep, the shells are under all that yummy sauce! 2 of them! Preheat oven to 375 degrees F. In medium non stick skillet, brown the sausage. While sausage is browning, put about a 1/4 cup marinara in the bottom of a 9 x 13 " glass baking dish and swirl around to coat bottom of pan. 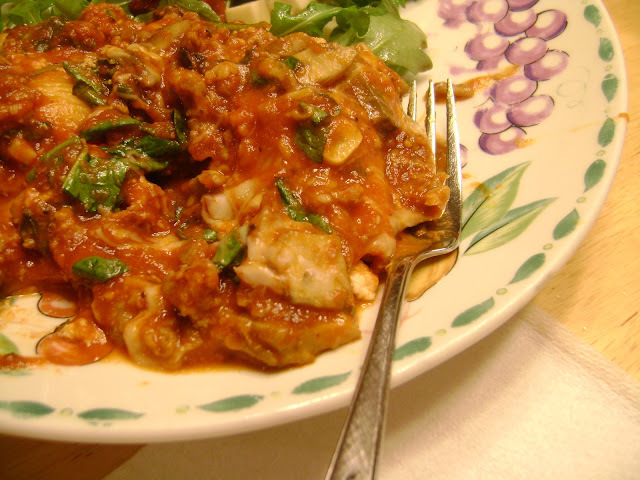 Arrange frozen shells in a single layer in the pan. Once sausage is browned, drain and in a medium sized bowl, combine the sausage and the rest of the marinara. In the same pan you browned the sausage in, add 1 tsp olive oil and garlic. Saute until garlic is soft, about 3 minutes. Add cooked garlic to the sausage/ marinara mixture. In the same pan you sauteed the garlic in, add the mushrooms and cook until soft, about 4 minutes. Add the mushrooms and juices to the marinara/sausage/garlic mixture, then add the chopped baby spinach to the sauce, stir to combine. Spread the sauce on top of the shells. Cover with foil. Bake in oven for 45-50 minutes. 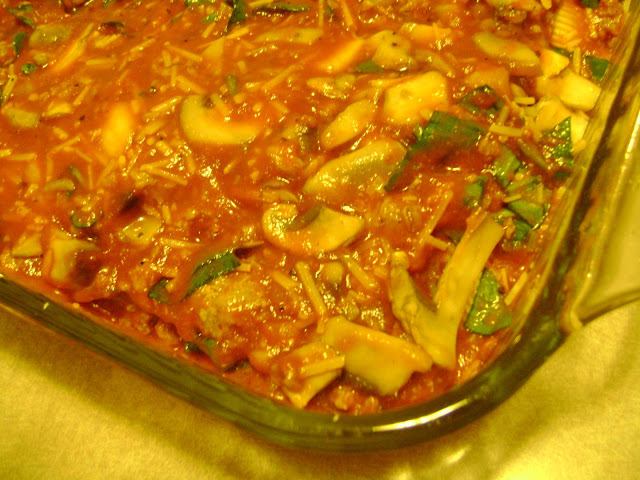 Uncover and add cheese on top of shells, bake for another 10 minutes, or until cheese is melted and sauce is bubbly. Remove from oven and allow to sit for 5 minutes before eating. Serving size is two shells with about a 1/2 cup of sauce for 7 points. Spinach and pasta is a very dear combination to me. This one is one comfort meal all family can enjoy.